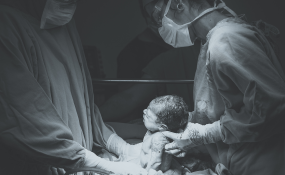 When pregnancy or childbirth go wrong, access to Caesarean section - usually known as C-section - can be the difference between life and death for both the woman and her baby. Because they can save women's and infants' lives, C-sections should be universally accessible. But they aren't. This is clear from the fact that there's a huge disparity in C-section rates between countries, and even within countries. These patterns are highlighted in a recent Lancet series "Optimising Caesarean section use". The reports show that the number of children born by C-section worldwide was 29.7 million (21.1% of all births) in 2015 - nearly double the number in 2000. Wealthier women and private healthcare facilities are major contributors to the global increase of non-medical (those that aren't absolutely necessary for medical reasons) C-sections. The Lancet reports show that access to C-sections remains a challenge in many low-income countries, particularly for poor women. This is especially true in sub-Saharan Africa. This means that poorer women - and their babies - are at a higher risk of dying during childbirth if there are complications. The Lancet reports highlight how much work still needs to be done to ensure that, on the one hand, poor women who need the service get it, and on the other, that it's not overused and abused. The rise in C-sections - most of which is happening in developed countries - isn't viewed as a universally good thing. While more women can now access life-saving surgery, there's also evidence that C-sections are being used when they're not needed. For example, wealthier women opt to have a C-section for non-medical reasons such as to avoid the pain of childbirth. This has led to overuse and is a cause for concern in many of the world's regions because a C-section remains a major surgery with potential short and long-term complications for the mother and the newborn. In countries with low access to C-section - classified as less than 10% of births - the main drivers appear to be total fertility rates, female enrolment in secondary education, and the ratio of doctors to patients. Ethiopia is a good example of big discrepancies between rural and urban areas. The national C-section rate in the country was 2%, but the capital Addis Ababa reported 21.4%. There are two challenges when it comes to C-sections - the first is to ensure that all women - no matter what their economic circumstances - should have access to surgery if they land up in difficulty during child birth. The second challenge is that overuse of C-sections needs to be managed. This will require making sure that financial motives aren't the biggest driving force behind decisions to do a C-section, and that the hospitals are sufficiently resourced so they don't go for the "cheaper" option of an elected, pre-planned operation.